132 x 96 x 44 inches. 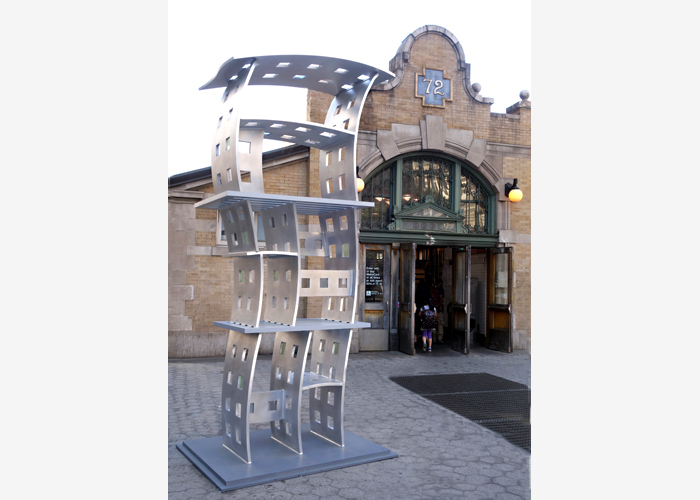 PRESS RELEASE: The Broadway Mall Association, NYC Parks and the Morrison Gallery of Kent, CT are pleased to announce a major exhibition of large-scale sculptures by American artist Don Gummer from May 15 through early November 2015. 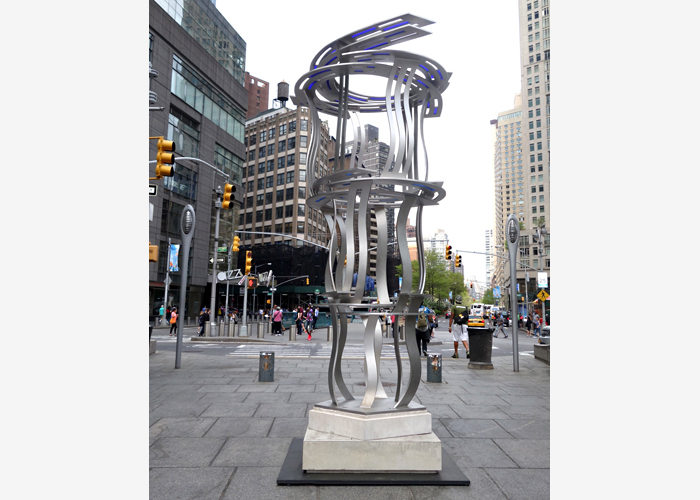 The exhibition will feature nine aluminum and stainless steel sculptures along the Broadway malls from Columbus Circle to 157th St. This is the artist’s first outdoor public art exhibition in New York City. Don Gummer on Broadway will open with a ribbon-cutting ceremony on May 15 at 11 a.m. on Broadway between 71st and 72nd Streets. A highlight of the exhibition will be five examples of new work from Gummer’s haiku series, created in 2014 and 2015, which will be shown for the first time and were created especially for this exhibition. Four additional works dating from 2011 and 2012 will also be included in the exhibition. The sculptures range in height from eight feet to 14 feet. “I first became interested in haiku poems because of the simplicity of their structure,” stated the artist. “Three lines stacked together containing 17 syllables. Five in the first line, seven in the middle, and five in the third line. I thought of substituting shapes for the syllables and instead of writing a poem with three sentences and 17 syllables, I made a sculpture with three vertical sections and 17 shapes, five in the bottom section, seven in the middle, and five in the top section. The three sections are separated by horizontal, linear flat rectangles, my version of lined paper. A cell phone tour, in English and Spanish, which will include the artist's commentary, is funded by Con Edison. Don Gummer (born in 1946) is one of the country’s most imaginative and inventive sculptors working today, creating work of compelling strength, authority, and grace. He is known for his unique style based in the modernist tradition of Constructivism, imbued with a strong architectonic quality, and characterized by a masterful attention to craftsmanship and detail. His work first came to the attention of the New York art scene in the late 1970s and early 1980s and is represented in prominent public and private collections and commissions worldwide. Gummer attended the School of the Museum of Fine Arts, Boston and received both a BFA and MFA from Yale University. The artist lives and works in New York City. The Broadway Mall Association is a non-profit organization, working in partnership with community residents, businesses, other non-profit groups, and NYC Parks to beautify and maintain the malls of Broadway from 70th Street to 168th Street. The malls are a 5.5 mile- long park that provides a welcome green space from the Upper West Side through Harlem to Washington Heights. Residents and visitors enjoy plantings and public art installations, often from the perspective of the Broadway mall benches. Please see: www.broadwaymall.org. Art on the Malls is the Broadway Mall Association’s program to enliven the Broadway malls with contemporary art, which was launched in 2005 with the major exhibition Tom Otterness on Broadway. Since then, the BMA has exhibited the work of more than fifteen internationally recognized artists on the malls, including Saint Clair Cemin, Dan Colen, Carol Eisner, Manolo Valdés, and Peter Woytuk. Morrison Gallery is located in Kent, Connecticut and specializes in exhibiting the work of contemporary luminaries and modern masters. The soaring, modern, 7,000 square foot gallery space allows for the exhibition of large-scale sculpture and installations, while smaller rooms provide a more intimate viewing experience. William Morrison, owner and founder of the eponymous Morrison Gallery, has been known for exhibiting large-scale sculpture since founding the gallery in 1999. 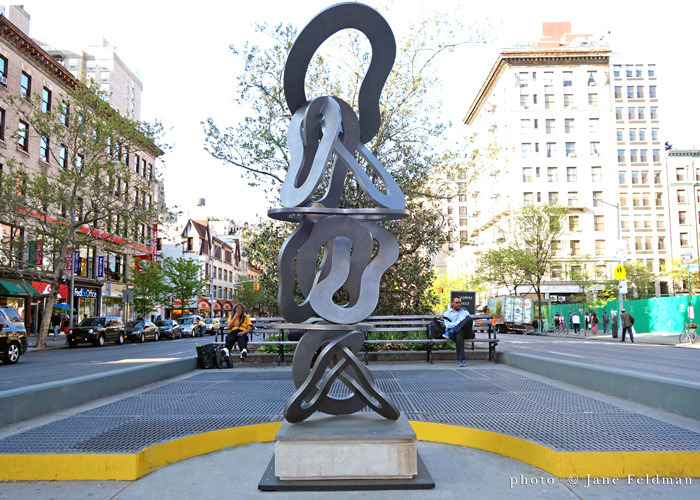 Morrison recently launched Sculpture on 7, an annual sculpture event aiming to bring monumental sculpture to Kent, and has curated and installed numerous outdoor sculpture exhibitions in New York City. The public art program of NYC Parks has consistently fostered the creation and installation of temporary public art in parks through the five boroughs. For nearly fifty years, collaborations with arts organizations and artists have produced hundreds of public art projects in New York City parks. For more information on the Art in the Parks Program visit: www.nyc.gov/parks/art.